When it comes to international competitions, the Kenya womens basketball team has been far more succesful than their male counterparts. The Kenya mens basketball team has qualified for the Africa basketball championships twice (1985 and 1989). 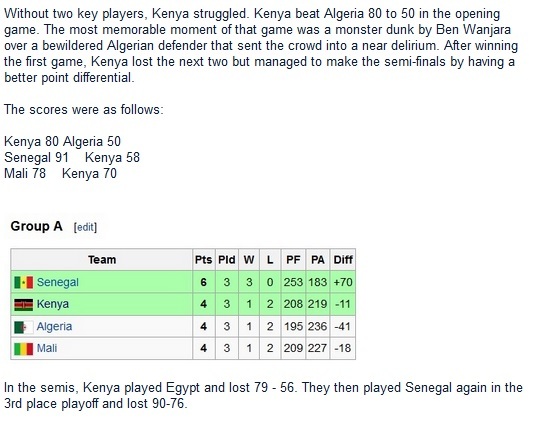 In 1993, Kenya qualified as hosts in 1993. The mens basketball team has been to the All Africa games once. That is in 1987. That Kenya has had talent available is proven by the decent number of Kenyan players who have done well in overseas leagues. Go to this page To read about Kenya players who have excelled in basketball in the USA and elsewhere. And this page has a list of other Kenya players who have played in USA college basketball. In 1987 Kenya hosted the All Africa games and this qualified automatically. This time Kenya gave a good account of themselves thanks largely to the partisan home crowd. They finished fourth missing a medal by a whisker. The players who featured for Kenya on that occasion included : Dominic Omach, Ronnie Owino, Jaffred Amugune, George Owino, Thomas “Smatts” Olumbo, "Big" Sam Omolle, Isaac "Ice-Man" Omolle, Vincent Mbulishe, Patrick Kariuki, Joshua Okeyo, "Big" Joe Odhiambo, Sebastian Ododa "Stanza"A key to Kenya's good performance is that they had trained for a long period that even included a tour to the USA that helped build cohesion among the players.The women led by captain Queen Olumbo finished 7th. Kenya Hosted the 1993 Africa basketball championships. 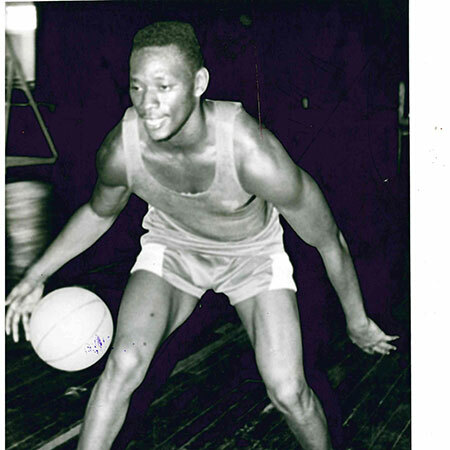 In the Kenya line-up pn that occasion were players like the amazingly athletic Ben Wanjara, who would later play for George Mason University in the USA. Then there were others like Ronnie Swaka, Ben Rateng. Lawi Odera, a sharp shooting three point specialist, who had starred with 30 points for KPA when they shocked Egyptian giants Al Ahly a year earlier, missed the tourney due to school commitments at Mombasa Polytechnic. It was a shame because Odera was easily the best Kenya player of the early 1990s and one of the best basketball players Kenya has ever produced. Also missing was another sharp shooting guard Fred Omondi who broke his arm weeks before the tournament. Without two key players, Kenya struggled. Kenya beat Algeria 80 to 50 in the opening game. The most memorable moment of that game was a monster dunk by Ben Wanjara over a bewildered Algerian defender that sent the crowd into a near delirium. After winning the first game, Kenya lost the next two but managed to make the semi-finals by having a better point differential.